One of the legendary epics of the silent cinema — and the first part of a trilogy that Fritz Lang developed up to the very end of his career — Dr. Mabuse, der Spieler. [Dr. Mabuse, the Gambler.] is a masterpiece of conspiracy that, even as it precedes the mind-blowing Spione from the close of Lang’s silent cycle, constructs its own dark labyrinth from the base materials of human fear and paranoia. A bridge between Feuillade’s somnambulistic serial-films and modern media-narratives of elusive robber-barons, Lang’s two-part classic set the template for the director’s greatest works: social commentary as superpsychology, poised at the brink of combustion. The Masters of Cinema Series is proud to present Lang’s early masterpiece in its fully-restored version on Blu-ray in 1080p for the first time ever. With the etching onto glass of a single word – “MABUSE” – Berlin reawakens into a nightmare. 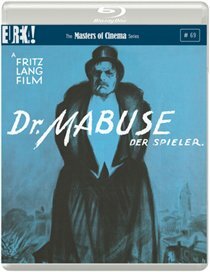 Fritz Lang’s electrifying Das Testament des Dr. Mabuse [The Testament of Dr. Mabuse] is the astonishing second instalment in the German master’s legendary Mabuse series, a film that puts image and sound into an hypnotic arrangement unlike anything seen or heard in the cinema before – or since. Not only a follow-up to Lang’s earlier Dr. Mabuse, der Spieler. [Dr. Mabuse: The Gambler. ], but also, with the presence of Otto Wernicke’s Police Commissioner Lohmann, a semi-sequel to Lang’s immortal masterpiece M, Das Testament des Dr. Mabuse is itself considered by many to be Lang’s greatest achievement – a work of terrible and practically supernatural power that seems to have prophesied the implications of the Nazi scourge. 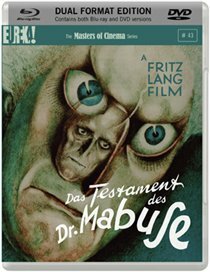 The Masters of Cinema Series is proud to present Das Testament des Dr. Mabuse for the very first time on Blu-ray, in a Dual Format (Blu-ray + DVD) edition.